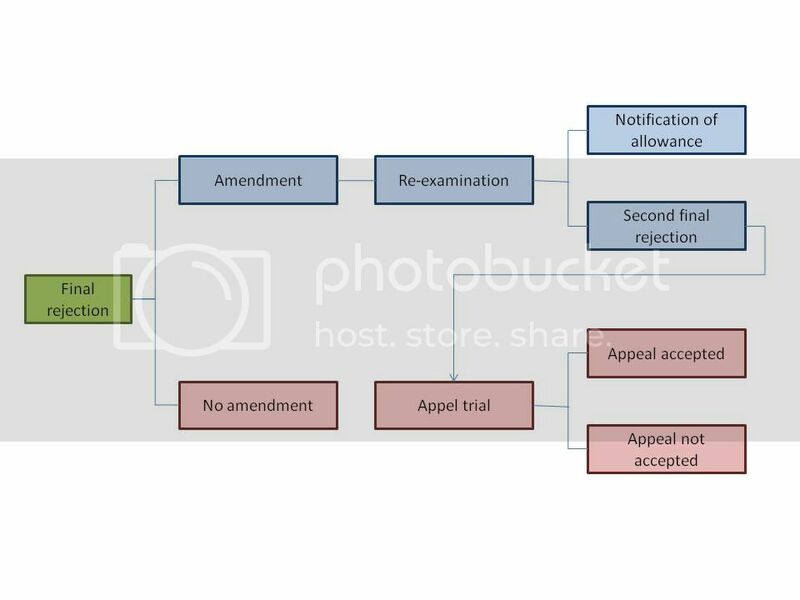 In Korea for about 64% of all applications (2012) where appeal was requested after a final rejection had been issued, a patent has been granted. We can say that the appeal system is effective. In both cases the request has to be filed within 30 days of the issued date of the final rejection. Depending on whether amendments are made the procedures are different. If the applicant believes that the application is patentable without amendments, appeal is requested. It is also possible to amend the claims after a final rejection has been received. In this case re-examination will be requested and the application will be examined again based on the amended claims. Re-examination means that the same examiner will be examine the patentability of the application again. If the examiner judges the application as patentable, a notification of allowance will be issued. Otherwise a further final rejection will be issued. In response to this further final rejection appeal can be requested. In the recent issues we explained the appeal/re-examination system in Japan, China and Korea. In all 3 countries it is possible to amend after a final rejection has been issued. In Japan and Korea appeal can be requested and it is characteristic that for more than half of the applications a patent will be granted.